Are you seeking a forklift transportation company? You are not alone. Forklift transportation shipping quotes are our most popular heavy equipment shipping request. Forklifts come in all shapes and sizes. We proudly have experience shipping them all. 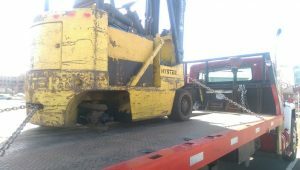 Maybe you are searching for a forklift transportation quote because you were let down by your previous shipping company. Transporting forklifts doesn’t have to be a stressful event if you choose the right company. Gone are the days of late deliveries full of excuses. You may have heard horror stories about Forklifts never making it to their final destination, arriving late, etc. Our forklift transportation drivers are licensed and insured. Is that not enough to make you consider We Will Transport It? Maybe our 400+ 5 out of 5-star reviews will! We strive to set ourselves apart from the competition. We accomplish this by not only offering extremely competitive rates but by also by treating each and every one of our customers the same way we would want to be treated. Unfortunately, there are many factors which would make it impossible to predict the cost. 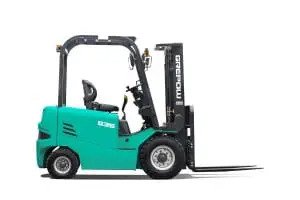 This is because there are many different sizes of forklifts, different amounts of distance to travel, different trucks (open air vs closed container) used to deliver them, etc. These factors play a crucial role in the pricing of delivering a forklift. However, we can tell you we are one of the most competitively priced forklift transport companies out there. If we weren’t, we wouldn’t be advertising to you because we wouldn’t book any jobs and would lose money. Curious if we ship your brand of Forklift? We proudly ship all brands of forklifts but some of the more popular forklifts that we ship are Caterpillar Forklifts, Crown Forklifts, Jungheinrich Forklifts, Mitsubishi Forklifts, Hamech Forklifts, Bendi Forklifts, Drexel Forklifts, & Donkey Forklifts. Do you constantly need to ship forklifts? If so, we have a solution for you. Call and speak to one of our friendly shipping consultants and ask about high volume forklift shipping. We might be able to save you more money than you are currently spending on your transportation solution. So if our looking for the price to ship a forklift, give us a call and we’ll be happy to quote it out based on your specific information. With so many options at your fingertips and hundreds of potential companies willing to ship a forklift, how do you know who to choose? First, we recommend that you make sure they are licensed and insured. This will protect your asset in the unlikely event of an accident. Second, you will want to make sure the company you are working with has fantastic reviews. Sure, there may be people with cheaper prices but if they have one or two-star reviews, then it is for a good reason. People usually do not go out of their way to write a long poor review for no reason. Third, make sure that you are getting competitive rates. All 5-star companies usually offer great pricing and service. Both are critical to having a flawless transportation of your forklift. Fourth, be wary of hidden fees! We have none, zero, zilch. It is important that you are not baited in with a low price only to have a hidden fee pop up. The same applies to upfront deposits. If you want to compare forklift quotes, let us do that for you so you don’t get any hidden fees or required upfront deposits. Lastly, ensure that the quotes you are receiving are from A+ DOT carriers. The last thing you want to do is try to save a hundred dollars by working with a DOT carrier with a less than a favorable report card. You have a few options when you ship a forklift. The most economical method would be the open air method. This is when your forklift would be put on top of a trailer which would expose it to the elements such as dirt, debris, wind, rain, snow, etc. Should you be shipping a brand new forklift, you will likely want to utilize container shipping. This is when the forklift would be enclosed to protect against the aforementioned conditions. Give us a call so we can consult with you if this is an option as sizing does impact availability. Keep in mind, shipping in this fashion will certainly cost more than the open air method. There is a downside to shipping with the container method. Typically, you must drain all fluids out of the Forklift. This is because if there are any leaks it does not ruin or destroy the trailer. At We Will Transport It, we leave the option to you. Our job is to inform you of the pros and cons. Our goal is to always treat you like our first customer to give you that great customer service which everyone truly enjoys. We hope we’ve provided you with enough information to make an educated decision in getting a quote from us your forklift transportation. If you have questions, please feel free to reach out to us so one of our friendly transportation consultants can help any questions that you have.